One might assume since I live in Alabama that I have a precious and holy heirloom recipe for Southern biscuits. Alas, I do not. My family isn’t originally from the South. Both of my parents are from Maryland, and my parents, two brothers and I moved from state-to-state every five years growing up. I did not have a Southern grandmother to show me the way of the sacred Southern biscuit. In fact, homemade biscuits were endearingly called “hockey pucks” at family get-togethers. I did, however, have a pint-sized Ukrainian grandmother on my mother’s side who made the best potato candy in the world and whose red and pink rose bushes were the envy of the neighborhood. Not only do I lack a Southern lineage, but my great, great grandfather James (below) fought for the North during the Civil War. He was captured by the South and, according to family history, escaped with three other men the night before his scheduled hanging. All I know is that my biscuit-making attempts over the years have proved disastrous. Hockey pucks, indeed. Too dry. Too crumbly. No flavor. Then a few months ago I had a breakthrough. Not only did I make a decent biscuit, I made the best one I’d ever tasted in a home kitchen. The process began with an Alton Brown recipe that boasted nearly 500 reviews and five stars. His recipe called for equal parts shortening and butter, but with no shortening in my pantry, I used all butter. The results were outstanding, a Southern biscuit in all of its intended glory: flaky, buttery layers, a crispy bottom and a golden-brown top. I know some biscuit purists swear by shortening, but I tested the shortening-butter biscuits and found they lacked the full flavor of the all-butter biscuits. And call this a near-cheat – a Paula Deen, if you will – but I also increased the butter in Brown’s recipe from four tablespoons to six. I’ve gone as high as eight tablespoons of butter, but I think six does the job. Unless I’m making them for special guests, in which case I unapologetically up the butter. I give both options below. Sin as you wish. 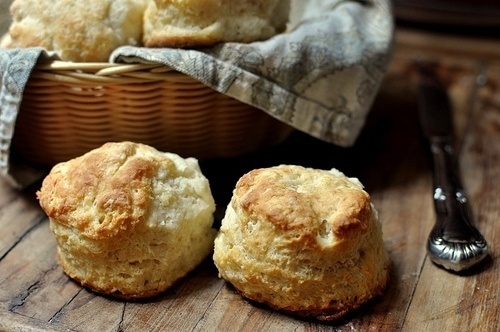 Thus far this year, this biscuit recipe is my most requested recipe. 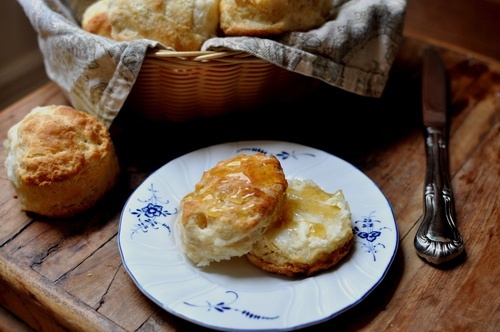 I use store-bought buttermilk about half the time I make these biscuits. The other half, I make my own buttermilk (it’s easy; instructions are below). In a pinch, I’ve also used half-and-half and was pleased with the results. Prep time is minimal and baking time is 20 minutes or less. Even on busy mornings, I can crank these out for the kids in less than 30 minutes. * If you don’t have store-bought buttermilk, you can make your own buttermilk or “sour milk” by adding 1 tablespoon lemon juice to a scant 1 cup of milk. Stir and let sit at room temperature for 10 minutes before using. It should look curdled. Cut the butter into small cubes and place them in the refrigerator. In a large bowl, combine the flour, baking powder, baking soda and salt. Add the cold butter cubes. With a pastry blender (my preference) or a fork or your fingers, work fast to blend the butter into the flour until it looks crumbly. Add one cup of buttermilk and stir until the dough starts to come together. If the dough seems too dry, add more buttermilk (a tablespoon at a time) until the dough is moist but not overly sticky. Transfer dough to a floured surface and pat it down until it’s approximately 1 1/2 inches high. Fold the dough in half. Gently pat it down and fold over again. Repeat five more times. (This process gives you those buttery layers.) Gently pat the dough into a circle and cut your biscuits with a biscuit cutter or other round mold (I don't have proper biscuit cutters, so I use a wine glass.). Push any remaining dough scraps together, pat them down, fold them over 2-3 times and cut into biscuits. Transfer the biscuits to a baking pan, positioning them side by side so they are touching. Bake for 15-20 minutes or until golden on top. Brush with melted butter. * Instead of a standard baking pan, use a cast-iron skillet or a cast-iron skillet griddle for even baking.